It is an important and popular fact that back in the 1980s I funded my computer gaming time by delivering newspapers. 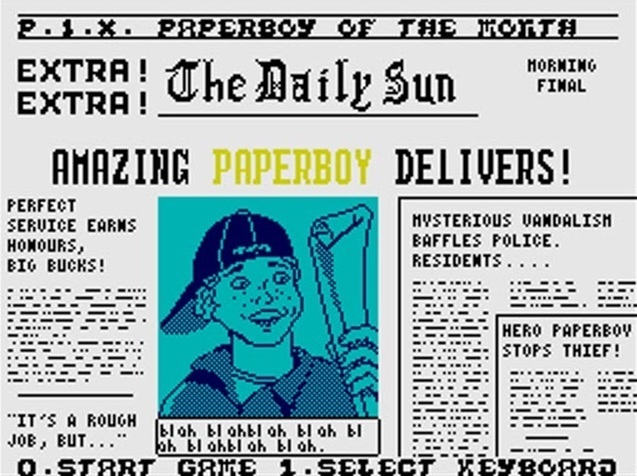 This fact is in some small way commemorated by the fact that, in a time of mid-life crisis, the first game I loaded up on my newly acquired rubber-keyed Spectrum was Paperboy. There was no deep reason for Paperboy; it was never one of my favourites, but, having been bought at some point between packing my old +2 away and acquiring a 'new' Spectrum, it was the first game that came to hand. As an aside, I loaded it up with the same cassette player I used back in the day - and had forgotten how long it took to load Spectrum games, which led to a very tense few minutes watching that unexpectedly colourful loader and half expecting the dreaded 'R: Tape Loading Error' message... but the error never came, the game loaded, and with the back-story explained, it's time for a review! 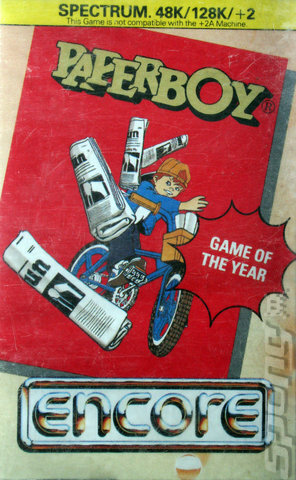 Released in 1986 by Elite, Paperboy was the officially licenced home computer port of the Atari arcade game. Apparently it was Game of the Year, and one of the biggest selling games of all time (at the time). For this review I was playing on the aforementioned rubber-keyed 48K Spectrum. The idea is to survive a week delivering newspapers in a typical American suburb - typical in that you will be set upon by vicious dogs, wobbly pensioners, and some sort of giant doughnut thing on an alarmingly regular basis. Also the neighbour's kid on his Sinclair C5, and the suburban commuters on their way to their boring jobs (which were probably also replicated in Spectrum games) would take offence at your lovely cyan BMX and try to remove you from it. If you survive to the end of your round, you get to play on the BMX track for a bit - a BMX track which rather worryingly looks like it goes through the middle of an archery range - and then presumably go off to school, watch Blue Peter and then start afresh the next day. Apart from the BEEPed ditty on the opening screen, there's not a lot of sound beyond a selection of clicks and bleeps to signify throwing a paper, scoring a bonus, knocking your nemesis off his C5, and so on. Far better to listen to some contemporary music - my soundtrack of choice is Bananarama's 'True Confessions' album from the same year, which I don't have on vinyl at all. Honest. As for the graphics, it's a strange paradox that so much was made of the Spectrum's colour palette when it was launched, but due the hardware limitations some of the best looking graphics were produced in monochrome. 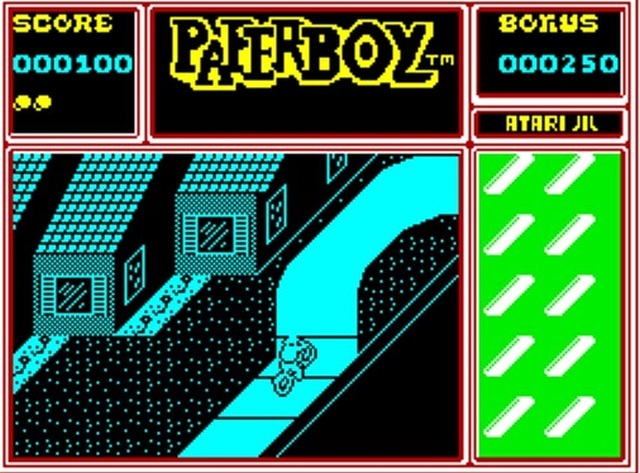 The playing field for Paperboy is presented in glorious black and cyan, with other colours used in other parts of the screen. The actual graphics are about as clear as any Spectrum game of the time; I'm not quite sure what some of the obstacles are supposed to be (are those really gravestones in every other front garden?) but it does the job. The scrolling is nice and smooth, and the cobwebs on some of the houses are a fun, random detail. For such a simple idea - throw papers at letterboxes and miscellaneous other targets - it's a pretty tough game to play well. It seems easy to just keep throwing papers randomly in the hope of hitting something now and then, but the idea is to keep your customers satisfied (although you can score bonus points for breaking the windows of ex-customers, as well as knocking down bins and skateboarders). It took me a couple of goes to get the hang of the BMX track too, the isometric scrolling confusing my ageing eyes at first and sending me crashing to the floor. It's also weirdly addictive, the simplicity of the gameplay giving it that 'one more go' factor; but as your aim gets better, you learn where to avoid the workmen, and you progress further into the game, the game starts to hate you, eventually putting remotely piloted lawnmowers in your path... This is one of those games that takes a few seconds to pick up, but can have you playing for hours if you intend to master it. On this occasion, the game itself didn't give the retro buzz as much as the experience, loading from tape, sitting on the floor in front of the TV with a rubber-keyed Spectrum... that said, it's definitely an 80s game, straight from the time when they'd make a computer game of anything (yeah I'm looking at you, Trashman! ).